Today, however, the author of this blog commented on my photo of this second larva that he thinks it is actually the larva of a moth in the genus Areniscythris (Scythrididae). I am familiar with that genus, having identified the first example on BugGuide earlier this year. I thought this ID was unlikely, in part because Areniscythris is only known from dunes along the Pacific Coast, and also because larvae of that genus live in silken tunnels, and there was no silk when I excavated this burrow—at least, I don’t remember any, and there is no evidence of any in my photos. However, there is an uncanny likeness, and when I compare the side view below with the one in the original description of the genus*, I can just make out prolegs on all the abdominal segments where there should be prolegs (without looking closely, I would have thought they were just pale sand grains). As far as I know, there is no known moth anywhere near Utah that is similar in appearance and habits to Areniscythris. This is certainly worth investigating, if anyone is in the area and is so inclined. 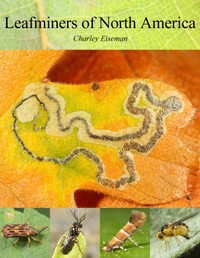 And speaking of micro-moth larvae in the western US that need further investigation, now would be a good time to look for the currant leaf-mining Acanthopteroctetes larvae I discussed here. I found them in a few different locations in Oregon, and Dave Wagner tells me he used to see them all the time in California but had mistaken them for sawfly larvae (as I had too, initially). Julia and I also found them to be extremely common in Colorado this summer, but unfortunately we weren’t able to rear any. 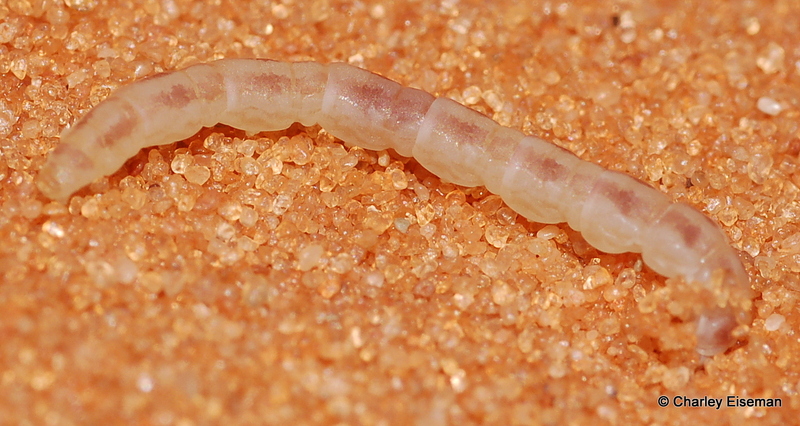 So whereas the mystery dune-burrowing larva may have a very limited range, and should be looked for in the Coral Pink Dunes specifically, the mystery currant miner apparently occurs over much of the area from the Rockies to the Pacific coast. 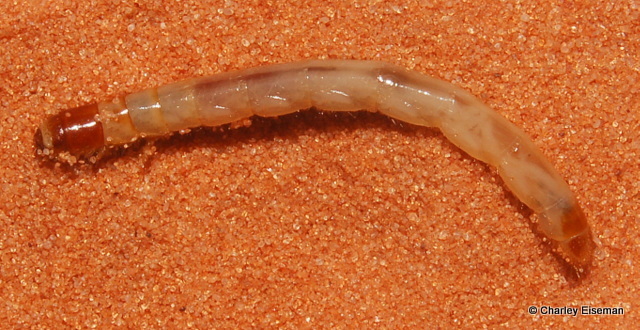 Edit, 10/13/2015: I wrote to Jerry Powell about this, and he responded that he and Jean-François Landry have actually collected samples of what they are calling Areniscythris from inland dune systems as far east as Alberta, but they haven’t yet gotten around to publishing descriptions of these species. He would expect any large dune system throughout the West to harbor a colony. He pointed me to the recently described A. whitesands Metzler & Lightfoot from White Sands National Monument in New Mexico (where Noah and I also did some insect tracking), which is treated in this paper** (which happens to be in the issue of the Journal of the Lepidopterists’ Society that includes my first moth-related paper). 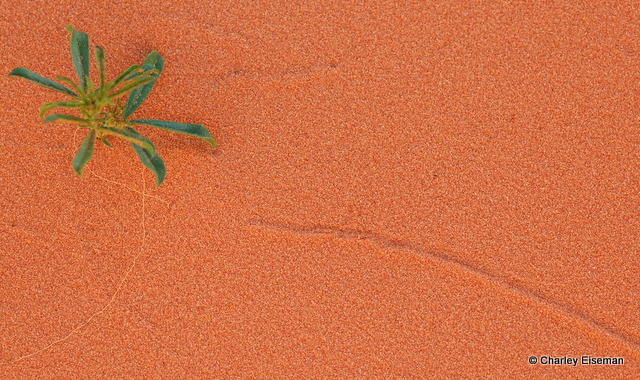 He also noted, “If the larva you found had constructed a burrow in hard packed sand, I expect it was not closely related — I think there are acrolophids, pyraloids etc. 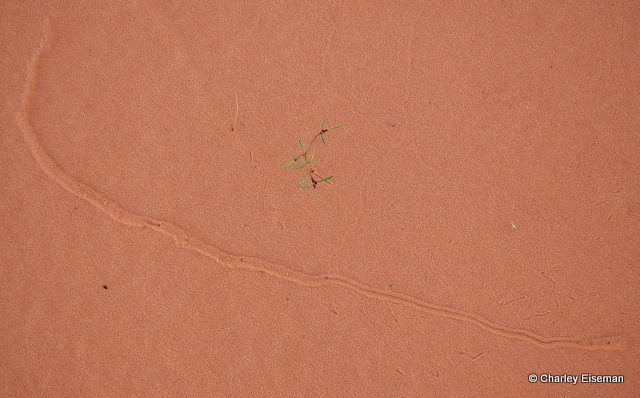 living that way on dunes.” I presume larvae in these other groups would look substantially different, but maybe not. * Powell, Jerry A. 1976. A remarkable new genus of brachypterous moth from coastal sand dunes in California (Lepidoptera: Gelechioidea, Scythrididae). 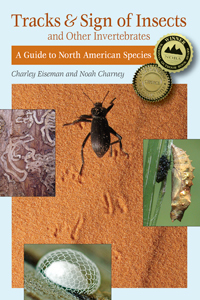 Annals of the Entomological Society of America 69(2):325-339. ** Metzler, Eric H. and David C. Lightfoot. 2014. 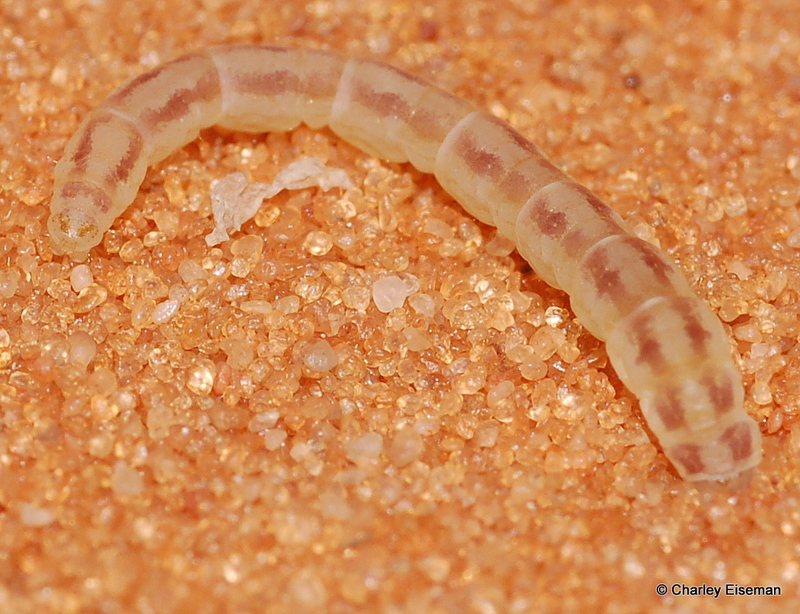 The Lepidoptera of White Sands National Monument 7: a new species of the genus Areniscythris (Scythrididae), a recently discovered iconic species from the Monument. Journal of the Lepidopterists’ Society 68(3):185-190. This entry was posted in Unsolved Mysteries and tagged beetle, burrow, darkling beetle, Gelechioidea, larva, moth, Scythrididae, Tenebrionidae. Bookmark the permalink. Cool stuff, thanks for linking to my blog! Also, the top larva looks like a Coniontis sp, they have a very distinctive look. Yes, dunes would make sense. They are darkling beetles after all, and they love dry, arid areas. I have bred Coniontis in the past, so I can say with great certainty that it looks exactly like one.